The nitrogen cycle is the cycle of chemical changes that involves the exchange of nitrogen between the air and the soil. Free nitrogen (N2) in the atmosphere cannot be absorbed directly by plants or animals. 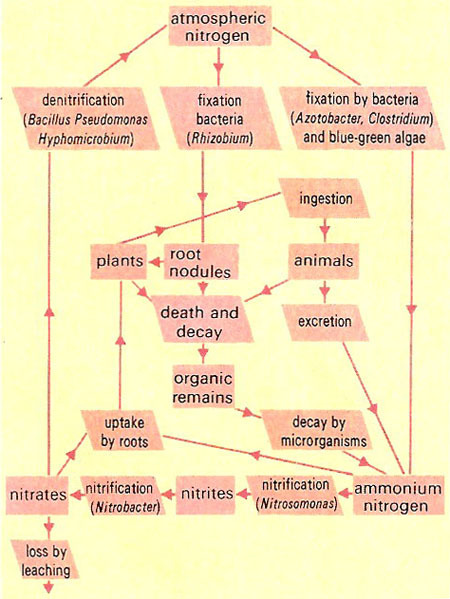 Nitrogen fixation – industrial (producing fertilizers) or by microorganisms – yields combined nitrogen as ammonia or nitrates, which can be absorbed from the soil by plants, which use them to make protein. Herbivores ingest nitrogen by eating these plants. Excretion products and animal and plant remains return nitrogen to the soil as complex compounds which are converted by fungi and bacteria to ammonium salts, which may then be oxidized to nitrites and nitrates by other bacteria. These are either reused by plants, or converted to nitrogen (by denitrifying bacteria) which returns to the air, thus completing the cycle.